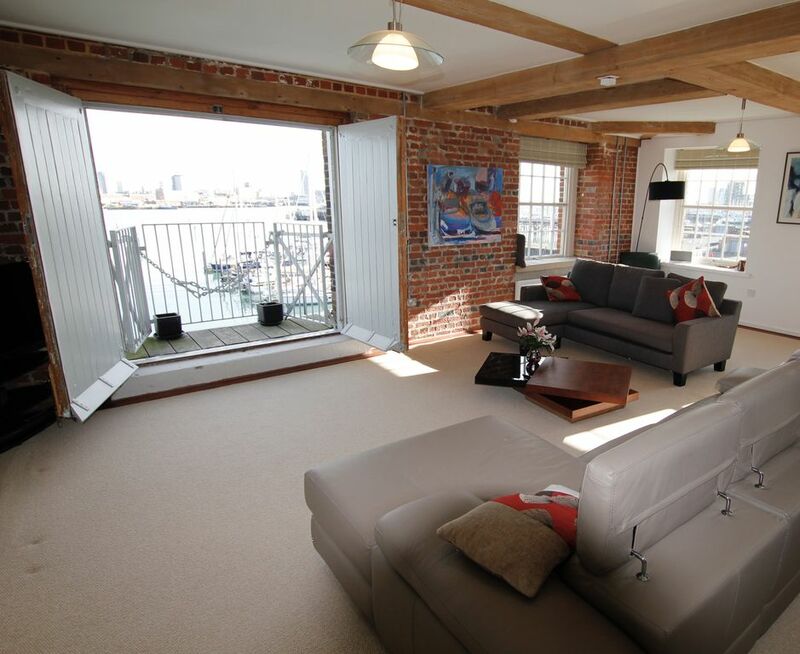 This 'Wow Factor' apartment with a waterfront location has been converted and furnished to a high specification with stunning views of Clarence Marina below and of the Spinnaker Tower, Portsmouth Harbour, HMS Warrior and the Naval Dockyard across the water. From Gosport it is only a short 4 minute ferry ride to Portsmouth and Gunwharf Quays, where on one side a wonderful cosmopolitan quayside complex with over 90 designer retail outlets plus 30 odd cafés, restaurants and bars are all sitting on the harbour entrance.This complex also offers a bowling alley and a multiplex cinema. Whilst the other side of the ferry landing offers the attractions of the Naval Dockyard with HMS Warrier, HMS Victory and the Mary Rose museum. On this side of the water a short walk accross the Millennium Bridge, a drawbridge from the apartment leads to the Explosion Museum and the Submarine Museum is also close by. We had a wonderful three-night stay at the apartment, with friends joining us for two of those nights. Everything about the apartment is good, but the living space (lounge, dining room and kitchen) is just perfect, especially with the ever-evolving views from every window, it's far better than a tv programme any day. We loved it and can't wait to go back. The apartment was amazing, a lovely view of the Harbour. Furnished to a high standard, comfortable beds with nice bedding and lovely towels. Everything we could possbly need was available. Sally is a perfect host. We are now looking forward to another holiday there sometime in the near future. Location was perfect, didn't need to touch the car all weekend. Apartment was beautiful, everything required and more. The apartment was terrific. The pictures and description are very accurate. The view off the balcony is beautiful. The place was very clean and Sally was very helpful. The location worked well for us. It is in walking distance to the ferry and then the train and bus stations are located right where you get off the ferry. I would definitely stay here again and highly recommend it. Everything was wonderful. Would not hesitate to recommend. Five star comfort and wonderful views.